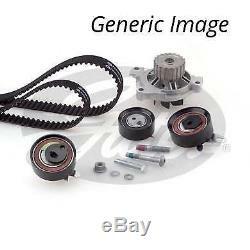 Water Pump & Timing Belt Kit GATES KP55323XS-1 For VW. VW LT Mk II Box (2DA, 2DD, 2DH) 2.5 SDI. 09.1996 - 07.2006. VW LT Mk II Bus (2DB, 2DE, 2DK) 2.5 SDI. 07.1996 - 07.2006. VW LT Mk II Platform/Chassis (2DC, 2DF, 2DG, 2DL, 2DM) 2.5 SDI. VW TRANSPORTER / CARAVELLE Mk IV Bus 70XB, 70XC, 7DB, 7DW, 7DK 2.5 TDI. 05.1998 - 04.2003. VW TRANSPORTER / CARAVELLE Mk IV Bus 70XB, 70XC, 7DB, 7DW, 7DK 2.5 TDI Syncro. 01.1996 - 04.2003. VW TRANSPORTER Mk IV Box (70XA) 2.5 TDI. 12.1998 - 04.2003. 09.2000 - 04.2003. VW TRANSPORTER Mk IV Box (70XA) 2.5 TDI Syncro. 09.1995 - 04.2003. VW TRANSPORTER Mk IV Platform/Chassis (70XD) 2.5 TDI. VW TRANSPORTER Mk IV Platform/Chassis (70XD) 2.5 TDI Syncro. The item "Water Pump & Timing Belt Kit GATES KP55323XS-1 For VW" is in sale since Tuesday, January 16, 2018. This item is in the category "Vehicle Parts & Accessories\Car Parts\Engines & Engine Parts\Belts". The seller is "asvela1995" and is located in Vilnius. This item can be shipped worldwide.